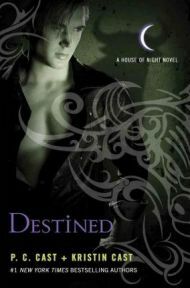 Destined is the ninth novel in the popular House of night series by P.C. and Kristen Cast. Set in the present day with vampyres as part of the normal fabric of society, the series follows Zoey Redbird from the day she is Marked to be become a vampyre through the discovery she is to be an important part of the fight against evil, and of course all the events which follow. In book number eight, Awakened, Zoey recovered from her journey to the Otherworld and yet another innocent character died. Awakened was followed by Dragon’s Oath, a novella, telling the backstory of a House of Night professor, which turns out to be relevant to Destined. By Destined, Zoey and friends, red vampyres/fledglings and Rephaim included, are preparing to return to classes at the Tulsa House of Night, where evil Neferet is still in charge. In terms of story, Destined is not the best or most exciting book in the series. There are however some interesting developments which will have implications for the wider story of the series as it continues. We lose yet ANOTHER well loved character, and this one is a real blow. But in all honesty, thinking back I should have seen it coming. A very unlikely alliance is formed, and it will be interesting to see where this leads in the books to come. This could completely change the direction of the story. There is a focus on character development in Destined, with one of these being Lenobia, the Horse Mistress of the House of Night. We learn a few snippets about her past, and find out more about who she is today. With the next instalment in the series being another novella, Lenobia’s Vow, due for release in January 2012, this aspect of Destined is clearly setting the scene for more of Lenobia’s story to be revealed. I enjoyed this insight into Lenobia – like Dragon, she is one of the good professors, and is a calming presence. I look forward to reading more in Lenobia’s Vow. For several books now, the story has been told from the viewpoint of various different characters, with Zoey being the only one in first person. In Destined other characters are introduced as narrators, with Neferet and Kalona having a larger presence, along with addition of Lenobia and Shaunee, and Neferet’s “protector” Aurox. However, by far the best aspect of Destined was the development of a previously irritating character. Zoey has two friends called Shaunee and Erin, known as the Twins – although physically opposites, they are glued to each others sides and complete the others sentences. For several books their role in the series has been decreasing, which was fine by me as while other characters matured, they remained immature and materialistic characters who dragged the story down. In Destined however, Shaunee begins to behave as an individual and separate herself from shallow Erin. I found myself quietly cheering her on as she realised that shopping and TV shows really aren’t that important given everything the group has been through, and her own background. Shaunee seems to be becoming a valuable character, and one who is no longer an annoying presence – her role in future installments of the series should be more enjoyable and interesting. Destined may not be the most exciting of the House of Night novels, although there is an epic showdown at the end, but it has some interesting developments which will clearly be of importance in books to come. It is recommended to read Dragon’s Oath between Awakened and Destined; although not essential in terms of the main story, it adds greater depth.